Rick Settersten joined the College of Public Health and Human Sciences in 2006. He is a professor of Human Development and Family Sciences and endowed director of the Hallie E. Ford Center for Healthy Children and Families. 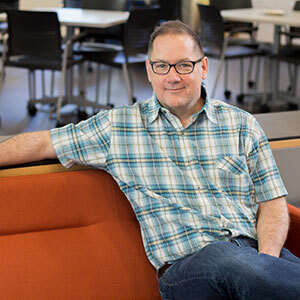 Prior to Oregon State, Rick rose through the faculty ranks from assistant professor to professor of Sociology at Case Western Reserve University in Cleveland, Ohio. In 1992, he received a doctorate in Human Development and Social Policy from Northwestern University in Evanston, Ill., and has held fellowships at the Max Planck Institute for Human Development and Education in Berlin, the Institute for Policy Research at Northwestern and the Spencer Foundation in Chicago. What made you decide to get into your field of study? Is there one specific moment that inspired your career path? “My mother will tell you that, even as a little kid, I was obsessed with time. Actually, she’d say that I was too concerned about being on time. I’d say they were too often late! But my interests in time were bigger than everyday rhythms and the fact that my parents and I lived on different kinds of time. My whole career would come to be driven by questions about how women and men experience time, age and the life course. 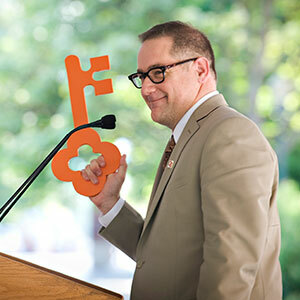 CPHHS Professor Rick Settersten holds up the “key” to the Hallie E. Ford Center for Healthy Children and Families during its grand opening ceremony September 2011. In an undergraduate course in adult development and aging, I watched an old film based on the landmark Kansas City Study of Adult Life of the 1950s. I can still see the image in my mind’s eye: There on screen was one of the investigators, Bernice Neugarten, complete with a beehive hairdo, talking about ideas that had deeply resonated with me in their articles. That every society has scripts that define a ‘normal, expectable life.’ That these scripts come with ‘age timetables’ for major life transitions — such as when men and women should finish school, get married, have children or retire. That people know whether they are ‘on-time’ or ‘off-time.’ And that in middle age, time seems to move more quickly and people begin to think more in terms of how much time they have left to live rather than how much time has passed since birth. “My longest standing work relates to the meanings of age and to perceptions of how the life course is organized in different societies. For example, I’ve been part of a team that gathered data in 25 European countries to learn about the ages at which women and men become ‘adult,’ ‘middle age’ and ‘old,’ and what social experiences mark movement into and out of these periods. In other work, I’ve been focused on understanding how the process of becoming an adult has changed in the United States and what skills young people need to be successful today. I was, for a decade, a member of a MacArthur network on this topic. I’ve been studying the years from 18 to the early 30s, and the factors that distinguish those who are doing well on a wide range of outcomes from those who are not. “Life course questions bring complicated puzzles. I’m interested in understanding how experiences in one period of life affect later ones, and how what is happening in one generation in a family or society affects others. These puzzles have given me license to wander intellectually. I can often be found working in the spaces between periods of life and disciplines, moving ideas from one to the other. But I’ve also been drawn to topics as a function of collaborators. That’s the beauty of team science. An old colleague was fond of saying, ‘Hey Rick, there’s an interesting cliff — want to jump off it?’ I love that question because it symbolizes what doing science sometimes feels like: You’re not sure how it’s going to turn out, but it’s adventurous and risky and, somehow, you’ll have to build wings along the way if you’re going to survive the fall. What would you say is the most fascinating aspect of this research? “We all stand on the shoulders of others: Acknowledge and thank the people who have helped you make your way. Be humble. Go where there’s energy inside you and where there’s energy in a group. Be playful in your work,” Rick gives as advice to students and alums. “I am repeatedly struck by this observation: That in the United States, private resources matter a great deal in determining people’s outcomes. It’s as true for childhood as it is for old age. As a life course researcher, I am confronted with the stark realities of advantage and disadvantage in our nation and with how much these accumulate over life and across generations. And yet, I’m also witness to the fact that human beings can be extraordinarily resilient in the face of adversity and that people with privileged beginnings don’t always escape negative outcomes. What do you most like about your role as director of the Hallie Ford Center for Healthy Children and Families? “Bringing people together, helping them find common interests and vision and nurturing their possibilities. People are willing to do all kinds of things in groups that they would never, and could never, try on their own. We also have a great leadership team at the Hallie Ford Center. When we’re meeting, the building bellows with laughter. I’ve tried very hard to make the center a warm and welcoming place for everyone. What’s next for you? Do you have any future research projects lined up? “Megan McClelland and I have just begun to co-edit the journal Research in Human Development. We’re very excited about our inaugural issue, ‘Just One Wish for the Study of Human Development.’ We asked 28 senior scholars to make a single wish for their field and to say why it matters and how to make it come true. The essays are full of great insights. I’ve also been working with Vern Bengtson of USC to co-edit a third edition of the Handbook of Theories of Aging. It’s been fascinating to learn about the development of theory in more than 30 different topic areas. 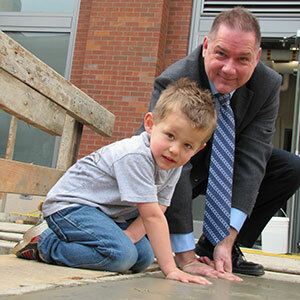 Hallie Ford Center Director Rick Settersten helps a child make a hand imprint outside the Hallie Ford Center during its grand opening festivities. “When I was an assistant professor, one of my senior colleagues told me: ‘If there’s something you really want to do and you’ve got a full plate, do it anyway — time will expand to fit the project.’ That advice has gotten me into trouble a few times, but it’s generally paid off. Passion goes a long way. But time can only be stretched so far. That’s why my nighttime is often measured in cups of coffee rather than hours of sleep. From Maya Angelou, who said: ‘I’ve learned that people will forget what you said, people will forget what you did, but people will never forget how you made them feel.’ That’s how I’ve tried to live and lead. “Spending time with husband, Dan; daughter, Maya; son, Mario; and chocolate labradoodle, Lando. Exploring the outdoors together in this beautiful state and having adventures in music, food, poetry and writing. Repeat.